If you dont have room in your garden, 'Moorpark' will be delighted to grow in a pot on your patio or balcony! 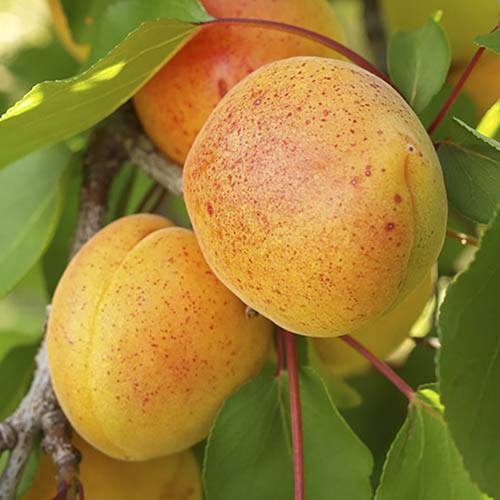 If you have always wanted to grow your own Apricots, this is the perfect time to start! 'Early Moorpark' is Self-Fertile and will grow and thrive in UK conditions, cropping reliably year after year and producing deliciously flavoured, aromatic bright yellow fruits which take on an attractive orange-red tinge when fully ripe and ready to pick in August. The fragrant light-pink blossom appears in early spring before the leaves start growing, making a beautiful display. Whilst the tree itself is fully winter hardy, to guarantee a good crop of apricots, plant it in full sun but against a south-facing fence or wall and cover with fleece to give further frost protection when it is in full flower. The pollinating insects will then set to work and make lots of lovely fruits to pick later in the year in a good year once fully established you might expect to pick 200-300 fruits per tree! If you dont have room in your garden, 'Moorpark' will be delighted to grow in a pot on your patio or balcony! Supplied as a 1.5m tall, grower quality, multi-branched 'bare root' tree. Grown on a dwarfing root stock. Will grow to approx. 2m (6-7 ft) in 10 years. Fully winter hardy. Self fertile.